Whether you need more reliable transport for a dealer trade, auto auction, or delivery to your out of state customer - Fisher Shipping can help. Fisher Shipping offers a range of exceptional dealership transport services. 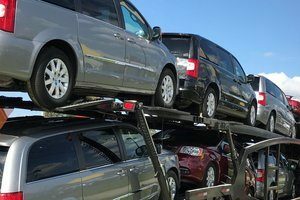 Whether you need auto auction transport, dealer trades or need to transport vehicles to out of state customers, we understand the unique challenges associated with every dealership transport scenario. Join hundreds of dealerships who rely on us for all their car shipping needs. Call 1 (888) 886-3456 today. Have a very anxious customer waiting for their new vehicle to arrive? Join hundreds of dealers around the country and let us coordinate all the details for you. We’ll coordinate everything for you to make sure all your trades go smoothly, and most importantly, happen quickly. We keep both you and the dealer you are trading with in the loop at all times. You’ve spent hours online trying to find the right vehicles for your inventory, but you can’t sell what you don’t have in stock. We’ll get these vehicles to your dealership faster than anyone else in the industry. We ship from all auctions in the US – including Manheim and Adesa. Multi-vehicle transport discounts are available. 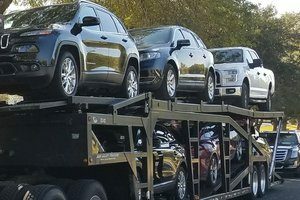 If you sell to customers online, you know how important smooth vehicle transport is. The transporter you choose reflects upon you and your dealership. Work with the experienced team at Fisher Shipping and our reliable and speedy vehicle delivery combined with unparalleled customer service will reflect well upon you and your dealership. Every time. We will walk your customer through every step of the auto transport process. We will make sure the last part of their vehicle buying experience is positive. In auto transport you get what you pay for, as you probably know if you’ve been burned by a cheap transporter. Instead of taking a risk by working with an unreliable transporter, work with the most trusted auto transporter in the industry. We may cost a little more, but it’s worth it! We’ll get your car delivered on-time with top notch customer service keeping you informed the whole way. Give us a call at 1 (888) 886-3456 to get started on your next vehicle transport. We are proud to ship the following vehicle brands anywhere in the country. Hear from more dealers and customers from the major auto brands we ship for by clicking on their respective link below.